Ferrari's Fernando Alonso has said he was "completely shocked" by the accident in which Marussia test driver Maria de Villota lost her right eye. De Villota, 32, is in "critical but stable" condition in hospital after crashing into a lorry at a test on Tuesday. Marussia have not revealed the cause of the accident. 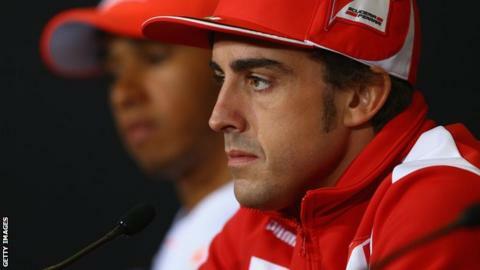 "Obviously we are all very worried about the situation and are waiting for more news," Alonso said. Alonso, the world championship leader, is Spanish, like De Villota, and revealed earlier this week that he had spoken to her family during the aftermath of the crash. Marussia announced on Wednesday that De Villota had an overnight operation on Tuesday to repair a fractured skull. There has so far been no further update on her condition but her sister Isabel released a statement on Thursday thanking everyone for their support. "We, the family, are supporting each other here at Maria's side and we take great comfort from the remarkable medical care she has been receiving," said the statement. "We remain positive and this is due, in no small part, to the overwhelming expression of love and support for Maria from every corner of the world. We would also wish to thank everyone at the Marussia F1 Team for all the care and attention they have shown us over the past few days." McLaren driver Lewis Hamilton added: "I don't know her personally but when I read about it I was absolutely devastated for her and her family, absolutely tragic. The team and I send our wishes to her and hope she has a speedy recovery." Felipe Massa has drawn upon his own experience of being involved in a Formula 1 accident to offer support for de Villota. The Ferrari driver was injured during qualifying for the Hungarian Grand Prix three years ago, when a spring broke loose from the car of compatriot Rubens Barrichello and struck him on the helmet. "She has my full support because I've been in a similar position. Thank God nothing happened to me," said the Brazilian. "My accident happened on track so it's different. The most important thing is that the FIA understands what happened. We need to make it the maximum safe we can. She has all my positive thoughts that everything will be OK."
Pedro de la Rosa, chairman of the Grand Prix Drivers' Association who strive to improve safety added: "We will put the facts on the table to see if there is anything we need to change to improve. De Villota failed to stop in the makeshift pit at a straight-line test at a Cambridgeshire airfield and hit the tailgate of a lorry that had been left in the down position. The team say they are conducting an investigation into what happened and will reveal more information at a later date.